While Leo Fender is best known for his Strat and Telecaster design, his legacy includes several more legendary instruments. One of the most prolific ones is the Fender Bass. The one we’re looking at today is pretty unorthodox considering the family of basses it belongs to. 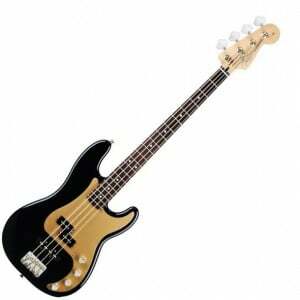 Even so, Fender Deluxe P Bass Special is among the top bass guitars you can get today. If you’d like to see other models that fit this description, check out our list for more info. On a first glance, this bass looks just like any other model from Fender’s collection. You got your standard alder body, a C profile neck, and that fine maple fretboard. The only thing that might indicate that something is up from a distance is the gold plated pickguard. And that is real gold, by the way. Fender really wanted to give you something deluxe to justify that word in this guitar’s name. While it might not be up everyone’s alley, you’ve got to admit that this bass looks smoking hot. Whilst they implemented a number of upgrades elsewhere, hardware is one of the areas which remained relatively standard. The bridge is the very same fixed unit with four fully adjustable saddles, which we have seen on many Fender bass guitars so far. On the other end of the neck, they’ve gone with a set of those trademark tuning machines Fender installs on most of their basses. You could say that the hardware is average, but it works like a charm. Here’s where things take off in a different direction. Fender Precision bass is known for its split coil pickup. Unlike the traditional version, Deluxe P Bass Special comes packing an active split coil along with an active single coil at the bridge position. This definitely allows for a whole new level of tone shaping on your end. Sure, that passive split coil is what helped P Bass reach the type of reputation it enjoys now, but this active setup is a breath of fresh air. Not only can you get the classic P Bass tone out of this thing, but the range of tone shaping available makes the Deluxe version a very versatile beast. You can go anywhere from Jazz Bass territory, over the classic Precision style, to more modern clinical tones which have become popular over time. Those who need a flexible setup will appreciate this kind of character, no matter how unorthodox it is. While it is definitely different, Fender’s Deluxe P Bass Special comes across a successful experiment which takes nothing away from the foundation it was built on, but rather adds something to it. Active electronics can be every bit as refined as the best passive set, if done right. I truly feel that this bass has hit that fine balance, which makes it one of Fender’s best models at the moment. Working musicians need to check this thing out. It’s that good. For more info about the Fender Deluxe P Bass Special, click here. For more Bass Guitars , click here. I have one of these and it is superb. You should mention that the neck dimension are that of a Jazz Bass. Thanks for the review on the Fender P bass. Liked the article & was struggling to make up my mind, between the Fender or Musicman. Cut to my decision, I bought a Fender Standard MIM bass in artic white, play’s rely well. Couldn’t go the full hog & purchase the American version. Great to be able to read an article & from there part with the cash.